See in Glossary performance. This means that you can have dense forests with thousands of trees, and still keep an acceptable frame rate. See in Glossary. Alternatively, you can create your own Trees. See in Glossary that you are importing supports Bend Factor, the Add Tree window displays a Bend Factor property for adjusting wind responsiveness. Trees created with the SpeedTree Modeler don’t have a Bend Factor; only those created with Tree Editor do. See the section on Making Trees bend in the wind, below. When you have configured your Settings (described below), you can paint Trees onto the Terrain in the same way you paint textures or heightmaps. To remove Trees from an area, hold the Shift key while you paint. To remove just the currently selected Tree type, hold down the Control key while you paint. After you select which Tree to place, adjust its settings to customize Tree placement and characteristics. Mass Place Trees Create an overall covering of Trees without painting over the whole landscape. After mass placement, you can still use painting to add or remove Trees to create denser or sparser areas. Brush Size Controls the size of the area that you can add Trees to. Tree Density Tree Density controls the average number of Trees painted onto the area defined by Brush Size. Tree Height Control the Tree’s minimal height and maximal height using a slider. Drag the slider to the left for short Trees, and right for tall Trees. If you uncheck Random, you can specify the exact scale for the height of all newly painted Trees within the range of 0.01 to 2. Lock Width to Height By default, a Tree’s width is locked to its height so that Trees are always scaled uniformly. However, you can disable the Lock Width to Height option, and specify the width separately. Tree Width If the Tree’s width is not locked to its height, you can control the Tree’s minimal width and maximal width using a slider. Drag the slider to the left for thin Trees, and right for wide Trees. If you uncheck Random, you can specify the exact scale for the width of all newly painted Trees within the range of 0.01 to 2. Random Tree Rotation If you configure the Tree with an LOD Group, use the Random Tree Rotation setting to help create the impression of a random, natural-looking forest rather than an artificial plantation of identical Trees. Uncheck this option if you want to place Trees with fixed, identical rotations. See in Glossary reads the _TreeInstanceColor property. For example, shaders for all trees you create with Tree Editor read the _TreeInstanceColor property. Tree Lightmap Static Enable this check box to indicate to Unity that the GameObject’s location is fixed and it will participate in Global Illumination computations. If a GameObject is not marked as Lightmap Static, you can still light it with Light Probes. There are two ways to create new Tree models. Use the SpeedTree Modeler from IDV, Inc. to create Trees with advanced visual effects, such as smooth LOD transition, fast billboarding, and natural wind animation. 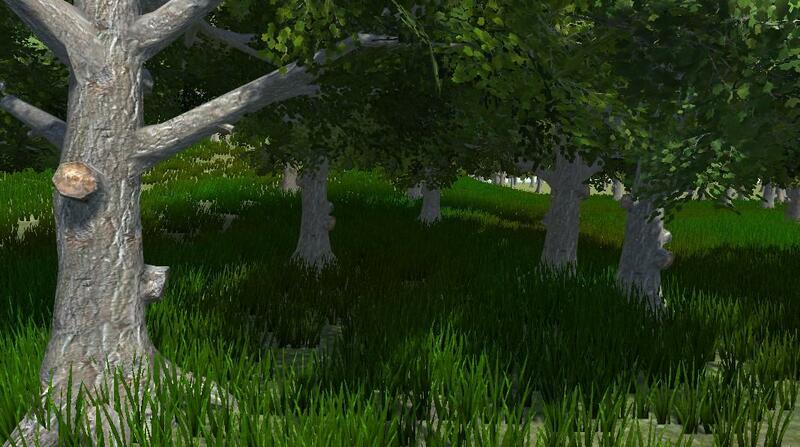 For more detailed information, refer to the SpeedTree Modeler documentation. Alternatively, use Unity’s Tree Editor to create Tree models. See in Glossary is present on the Tree Prefab’s root GameObject. A SpeedTree Prefab has an LODGroup component, but a Tree Editor Prefab does not. See in Glossary always has exactly two materials: one for the Tree body and the other for the leaves. See in Glossary in a way that is specifically designed for Trees. Note: When you import and alter a SpeedTree model in a 3D modeling program, then re-export it (as an .fbx or .obj), you might lose the natural wind animation functionality that comes with SpeedTree models. Create a new Prefab: drag the Tree GameObject into your Assets folder. This section only applies to Trees created with Unity’s Tree Editor, which have a Bend Factor. See in Glossary to create a Wind Zone. See in Glossary, and then select Edit Trees > Edit Tree. Set the Bend Factor to 1 if you have not already done so. With the default settings, Trees move quite violently. To fix this, change the Bend Factor for each individual Tree type. This is useful if you want some Tree types to bend more than others. To change the bend effect in the entire Wind Zone, directly configure the values in the Wind Zone component. To reduce the fluttering effect of the leaves, adjust the wind turbulence down to around 0.1–0.3, and everything becomes much smoother. If you don’t want the Trees blowing all the way to one side, and instead want some variation, set the Main value down to the same value as your turbulence. See in Glossary with 3D Tree models. This prevents any sudden popping of 2D and 3D Trees, which is vital in VR. See in Glossary and LOD Group documentation for more information about configuring LOD components.